Born in a rural homestead near Potgietersrus in 1916, Job Kekana made his first carvings while a herd boy. His father, a lay preacher and carpenter, died when Job was young, but had an important influence in that he wanted his son to have a Christian upbringing; as a result Job’s mother sent him to the only church school in the area, Anglican St Stephen’s at Rooisloot. A priest recognised the boy’s talent and in 1933 arranged for him to go to the Grace Dieu Mission near Pietersburg, where there was a thriving carpentry workshop. Unusually, this workshop taught carving, chiefly to produce decorated church furniture, an idea introduced by Father Ned Paterson (who had trained at London’s Central School of Arts and Crafts), and developed by Sister Pauline, CR. Under her guidance – and with Ernest Mancoba, who had worked at the school before him, as a role model – Kekana soon became a skilled sculptor, undertaking all manner of carvings for churches, from pews to pulpits. Soon after Sister Pauline was called to the mother mission in Grahamstown in 1938, then later to St Faith’s at Rusape in Rhodesia (Zimbabwe), Kekana left Grace Dieu to work independently in Johannesburg. Job reservation at the time restricted his opportunities even in the tedious carving of ‘ball and claw’ furniture. It also proved difficult to find buyers for his own work, although he made small carvings with popular ‘native’ scenes as well as religious subjects, such as the 1943 panel in the Campbell Smith collection. Interestingly, this relief combines a holy figure in conventional (albeit short) robes with indigenous animals – if this is St Francis preaching to the animals, it is quite different from the saint with more conventional birds and beasts which Kekana later made for the Community of the Resurrection in London. Paterson had encouraged an Africanisation of Christian subject matter for black congregations, but Kekana spoke of wanting his religious carvings to be ‘true’ historically, and usually only depicted Biblical figures as Africans in African settings if specifically requested to do so. Given his difficulties in the city, Kekana needed little persuasion to accept an invitation from Sister Pauline to join her in Rusape in 1944, where she had established a flourishing workshop. It was even asked to produce the ceremonial mace for the opening of the short-lived Federal Parliament of Northern and Southern Rhodesia and Nyasaland, carved by Kekana in 1954. Most of Kekana’s carvings were for church commissions and his work was dispersed widely, including a number of crucifixes in the eastern Cape, and the pulpit for St Mary’s Anglican Cathedral in Johannesburg. He was able to save up to fulfill an ambition to go to Oberammergau to see the passion play, described to him by Sister Pauline, although he only travelled in 1960, some years after her death. In his visits to European museums, he particularly admired the work of Michelangelo and Rodin, but also appreciated the intricate carvings of Grinling Gibbons in England. Most of Kekana’s time abroad was spent in London, where he was sponsored by the British Council to attend Sir John Cass College, which he valued because he improved his understanding of the human figure by drawing and modeling in life classes. Drawing from life would be an important part of his practice, which he also taught to his pupils when he decided to return to St Faith’s in 1964 to set up a carving school, assisted by the Beit Trust. During civil unrest in the 1970s, Kekana was very isolated in Rusape, although supported by a few loyal patrons such as Ben Gingell, an English publisher who had met him while working in Zimbabwe, and who sent Kekana fine photographs of African people as a basis for commissions. These were carvings in wood, Kekana’s favoured medium, although he also made sculptures in stone and bronze. 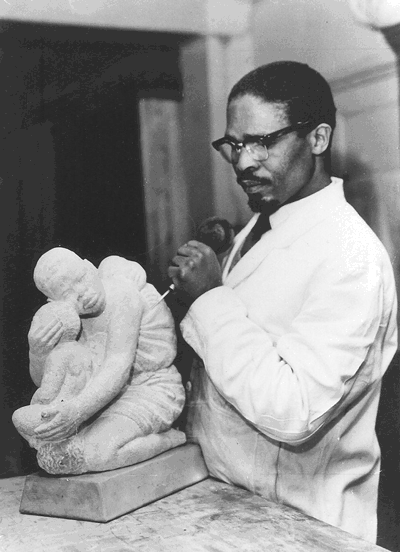 Throughout his career, Kekana worked in the naturalistic style he had developed during his mission training, his best carvings endowed with painstaking observation and a sensitive portrayal of character, their expressive quality enhanced by the skillful chisel marks that enlivened their surfaces. Church commissions continued. In 1986, Kekana completed a major work for St Mary and All Saints, Harare, commissioned by an American, Canon Louis Pitt: the monumental African christ, carved in pale jacaranda, is set against a dark cross with the signs of the four evangelists in relief quatrefoils at its extremities. In the early 1990s he made an orange-wood crozier at the special request of Archbishop Desmond Tutu, who had seen and admired an earlier example by him. Undeterred by lifelong personal disabilities – a badly dislocated arm and the loss of the sight of one eye since childhood, and an undiagnosed partial paralysis – Kekana continued carving until the time of his death in 1995. Butler, Guy. The Prophetic Nun. Johannesburg: Random House, 2000, 62-70. Miles, Elza. Land and Lives: a story of early black artists. Johannesburg: Human and Rousseau, 1997, 106-110. Rankin, Elizabeth. Images of Wood: aspects of the history of sculpture in twentieth-century South Africa. Johannesburg Art Gallery, 1989, 21-22, 111. Rankin, Elizabeth. In Memoriam – Job Kekana, Gallery 4 (Zimbabwe, 1995). Rankin, Elizabeth. Job Kekana: Mission artist, Trefoil 4 (Summer 1993): 16-17. Rankin, Elizabeth. Mission Madonnas: Imaging an African Mother of God, Material Religion 5 .1 (2009): 111-114. Born 1 January 1926, near Potgietersrus; died 10 March 1995, Rusape, Zimbabwe. Training: 1933-39 carpentry workshop, Grace Dieu Mission; circa 1960-63 Sir John Cass School of Art, and bronze casting at Camberwell College of Art, London. Exhibitions: 1934-42: Kekana’s work included with Grace Dieu entries at the SA Academy, Johannesburg; 1962-63: solo exhibitions in England, including Rhodesia House, London; 1967: Group exhibition with St Faith’s students, Harare; 1989: Images of Wood, Johannesburg Art Gallery; 1997: Land and Lives, Johannesburg Art Gallery. Collections: Johannesburg Art Gallery; Willem Annandale Art Gallery, Lichtenburg; National Gallery of Zimbabwe, Harare.